Our commercial grade aluminum rib umbrellas are a great solution for your hotel, resort, or HOA poolside. The aluminum ribs are square to create greater durability against harsh weather and abuse. The silver mist coated frames will not peel and rot in the sun and salty air, making it excellent for beach side. Our commercial aluminum market umbrellas are made to service hotels and resorts for many years without replacements. 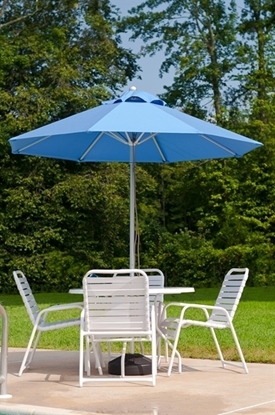 We offer quantity discounts when you purchase umbrellas with park furniture such as picnic tables, benches, or trash cans. Call our friendly staff for a quote on outdoor furniture from Park Table.